I just heard breaking news during the Keith Olbermann show that Kirby Puckett died of a stroke today at age 44. For those of you who don't know, Kirby Puckett played for the Minnesota Twins, and is, without a doubt, my favorite sports star ever. My sister and I both loved Kirby, she even had a Kirby Puckett jersey. The best thing I ever saw during any sports game was Kirby Puckett hitting an in-park homerun. It is hard to believe that someone so compact could run SO FAST, and round all the bases. I don't think I'll ever see anything better in a baseball game. I realized when I heard this that he's probably the only sports figure whose death I would care much about - for those who know me, you know that sports is not exactly my thing. But I really do feel like it's a 'sad day in sports' now. (CNN) -- Baseball Hall of Famer Kirby Puckett, who helped lead the Minnesota Twins to World Series titles in 1987 and 1991, died Monday after suffering a stroke over the weekend, the team announced. He was 45. "Kirby's impact on the Twins organization, state of Minnesota and upper Midwest is significant and goes well beyond his role in helping the Twins win two world championships," Pohlad said. "A tremendous teammate, Kirby will always be remembered for his never-ending hustle, infectious personality, trademark smile and commitment to the community. There will never be another 'Puck.' "
In the January phase of the 1982 draft, the Twins selected him third in the first round. He became the ninth player ever to collect four hits in his first game for Minnesota. 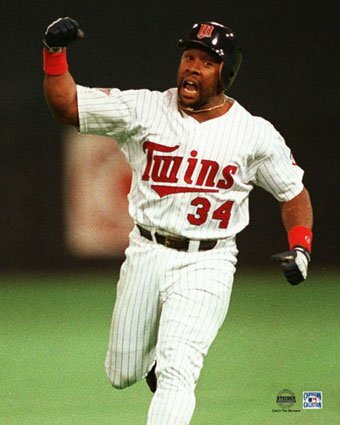 In 1991, in Game 6 of the World Series versus Atlanta, Puckett collected three hits, three RBIs and scored two runs and became the ninth player to end a World Series game with a home run on the final pitch, the Twins said. That home run, in the 11th inning, forced a Game 7, and the Twins collected their second championship in four years the next day. His .318 lifetime batting average ranked as the highest for any right-handed batter since World War II, according to the site BaseballLibrary.com. In 2001, he was elected to the National Baseball Hall of Fame on the first ballot, becoming the third-youngest living electee in baseball history behind Sandy Koufax and Lou Gehrig.